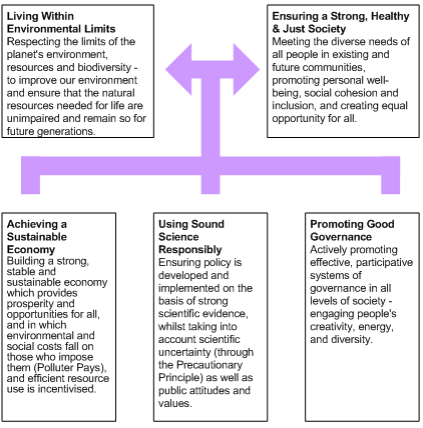 Sustainable development recognizes that the three ‘Pillars’ – the Economy, Society and the Environment are interconnected. 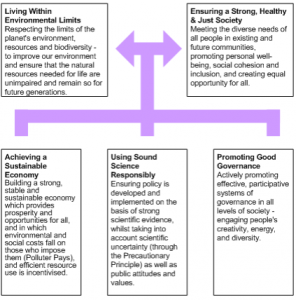 The UK government’s vision for sustainable development builds on the five inter-related guiding principles which form the basis for sustainable development in the UK. It recognizes the needs of the economy, society and the natural environment, alongside the use of good governance and sound science. Want to know more about the ESOS scheme? On 26 June 2014, the Department for Energy and Climate Change (DECC) published the ESOS (Energy Savings Opportunity Scheme) Regulations 2014. ESOS is an energy assessment scheme that is mandatory for large organisations in the UK with more than 250 employees, turnover in excess of €50m and an annual balance sheet total of €43m. The UK scheme administrator is the Environment Agency. Measure your total energy consumption across buildings, transport and industrial activities. Conduct energy audits to identify cost-effective energy efficiency opportunities. ESOS will operate in four-yearly compliance phases. Organisations in the UK must assess whether or not they are required to participate in ESOS on the qualification date of each phase. The qualification date for the first phase is 31 December 2014.